Start off by taking your brow comb and brushing your brows to tame their appearance.This makes it much easier to evaluate which parts of your natural brow need altering. Dip your angled brush into an eyeshadow 2-3 shades lighter/darker than your natural hair color. If your hair is naturally light, aim for a shadow 2-3 darker than your brows to truly give them definition. Conversely, if your hair is naturally dark, aim for a shadow 2-3 shades lighter than your natural brows to fill them in without them being too bold or overpowering. Using the angled brush, begin filling in any sparse areas on your actual brow. Don’t worry about shaping your actual brow yet – just focus on filling in the areas of your natural brow that tend to have small gaps. This will make your brow look more unified. Make sure to use light and frequent strokes to achieve the most natural outcome. After you have filled in your entire brow, start worrying about the actual shaping. Do this by outlining your brow – almost mirroring the natural shape of your brow, just perfecting the edges. This is much easier to do and much more apparent when your brows are combed and filled in. However, the actual process involved differs per person depending on their natural brow shape. Again, make sure to use light, small strokes to make the outcome as natural as possible. 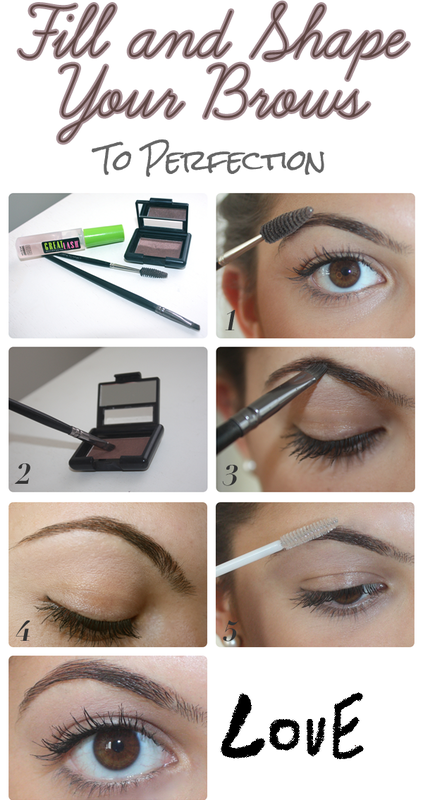 Set your brows using a clear mascara and do so by simply running the brush through all the hairs. This will keep everything in place, while securing the color in it’s spot so it lasts you all day! After 5 quick steps, you’ll be done and totally redefined! Good luck girls!